Why would anyone build pen capability into a device and then hide it from potential buyers? It's not the first time I've asked that question on this site, and it's especially one I shouldn't have to be asking myself in mid-2016, at a time where pen computing is being promoted as a vital feature of the upcoming Windows 10 Anniversary Update. But here is yet another illustration of this bizarre behavior: the Dell Inspiron 15 7568, the convertible laptop with the largest Wacom Active ES display I've ever tested. But you'd never know about it by reading the Dell or Best Buy websites. An eagle eyed reader over at TabletPCReviews forums made the discovery while looking at the compatibility list for Dell's Active Pen: "Inspiron (7568) (FHD Only) 'wake up feature not available.'" Positively lyrical description, isn't it? The 7568 retails for $750 with a 256 GB SSD at Dell.com. Best Buy sells an exclusive version with a 500 GB HDD for $700 that has recently been discounted to $650. A couple of weeks ago, the retailer also offered several of these as Open Box items for under $600. I don't like buying used or demo items, but for the purpose of this review, I thought it was prudent to save a few bucks. Even if you're not able to score the steep discount that I did, the Inspiron 15 is a very nice value, with a Core i5-6200U processor clocked at 2.3 GHz and 8 GB of RAM. The 5400 RPM HDD is slow, so you will definitely want to upgrade it to an SSD sometime down the road. Be aware: Dell and Best Buy both carry a 7568 model with a 4K UHD display. It's got an i7 processor and Best Buy sells it with a 1 TB HDD for $900. This tempting package IS NOT penabled! I found out the hard way after spending a few hours setting it up and attempting to install the Feel driver. Whoops. What part of "Inspiron (7568) (FHD Only) 'wake up feature not available'" did I not understand? The seemingly insignificant 1.6 inch diagonal difference between the Dell Inspiron 15 (above, top) and the Lenovo Thinkpad Yoga 14 is a surprisingly big deal in practice. The Surface Book's 13.3 inch Clipboard (above, bottom) looks positively tiny by comparison. I once insisted on owning only 17-inch laptops and I frankly don't know how I did it. Perhaps it's because I've grown accustomed to 12-inch displays on the Surface Pro 3 and 4, but the Inspiron 15 feels ginormous: 15.04 inches wide by 9.94 inches tall. Fortunately, the laptop is only .78 inches thick and feels light at 4.8 lbs. The brushed aluminum keyboard reminds me of my old MacBook Pro, with low profile keys, a large trackpad and plenty of room to rest your hands as you type. I prefer the typing experience on the Lenovo Thinkpad Yoga 14, but it isn't difficult to get accustomed to these keys. The touchpad isn't as responsive as the Apple's, but it's not bad, as far as Windows trackpads go. Dell commits the sin of placing a sticker on the keyboard that is sure to be a pain to remove. We already bought the laptop, Dell! No need to keep selling us! There's an attractive bevel edge all around the touchpad and the keyboard base that manages to not be too sharp to the touch. The lid and bottom of the laptop are coated in a rubberized black coating. It's unfortunate that more of the surface isn't brushed aluminum as it would have given the Inspiron a less generic looking exterior. The 7568 has a security cable slot, a power adapter port, HDMI out, two USB 3.0 ports and a headphone jack along its left side. On the right, you'll find power, volume controls, another USB 3.0 port and a media card reader. Setting up the Inspiron can be a bit of a nightmare if you don't know what you're doing. There appear to be issues with the default wifi driver and both the UHD and FHD laptops failed to connect while doing the initial Windows 10 setup. I was prompted to create a local account and then when reaching the desktop, I couldn't go online to bring the machines up to date. Fortunately I had an Ethernet to USB adapter at my disposal and was able to get online and run the Dell Update, which includes a new wifi driver. If you don't have an adapter available, you may be headed back to the Geek Squad for assistance. The Inspiron ships in a near Signature Edition state, with next to no crapware. The Dell Update runs too silently for my taste, giving very little indication it is doing anything in the background. I run Windows Update immediately upon setting up a new device and I had no idea the updates were running simultaneously. It was no big deal in the end, but if you experience slow downloads at first, this may be the culprit. In benchmark tests, the Inspiron 15 isn't exactly a speed demon, scoring between -13% and -76% vs. the Lenovo Thinkpad Yoga 14, which has the same processor. Some of this is definitely due to the slow HDD. But the biggest differences are on graphics tests, where the Intel HD Graphics 520 is simply no match for the Yoga's NVidia 940M. With such a large device, it's unfortunate that Dell couldn't squeeze in a discrete GPU. On the positive side, the laptop is among the quietest and coolest I've ever used. Even when running graphics intensive benchmarks, the i5's fans remained mostly silent and it only became warm to the touch in the upper left corner of the keyboard base. Speaking of the base, it can be easily opened to access the hard drive and single DDR3L RAM slot. Dell markets at least two Wacom Active ES pens: the first generation Active Stylus (right) and the second generation Active Pen (PN556W). Both work with the Inspiron 7568, but you'll prefer the newer, larger Bluetooth pen. Because the pen capability is a hidden bonus on the 7568, you'll need to order one separately. The Dell website lists several active and passive pens, so you will have to be careful when ordering. 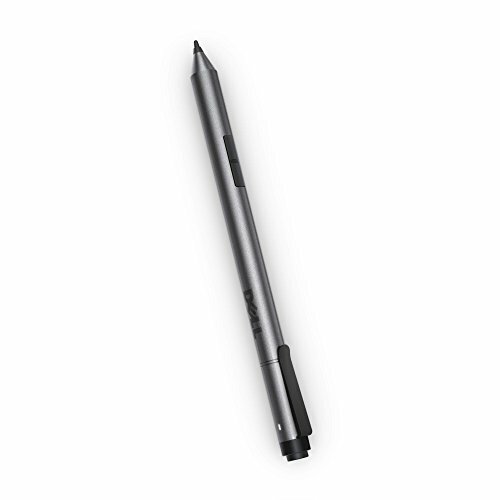 The compatible Dell Active Pen is part number PN556W and retails for $50. The Dell Active Pen (center) is a full size instrument comparable to the Toshiba dynaPad's TruPen (bottom) vs. the stubby Dell Active Stylus. The narrow gap between the two pen buttons on the Dell pen (left) makes them much harder to distinguish by touch. This new pen is a major improvement over the previous Dell pen I had tested. It's about the same length and diameter as the Toshiba dynaPad TruPen and features a Bluetooth end cap pen in addition to two side switches. This pen design hints at the blending of the Microsoft and Wacom Active ES technologies promised by the upcoming Dual Protocol pen due out at the end of the year. Hover distance is very comparable to the TruPen, about a quarter-inch from the display. I prefer the feel of the TruPen's slightly softer nib, but the Dell tip won't deteriorate as rapidly. The buttons are flush with the barrel and only have a furrow between them, making it really difficult to find and distinguish them by touch alone. By contrast, the buttons on the Toshiba pen have a much wider gutter so you can feel the ridge of each as you slide your finger along the barrel. When the Dell Active Pen is detected, the Wacom Feel driver allows you to configure the top pen button, a feature we've only seen on the Surface Pen control panel to date. The Dell Inspiron 15 7568 is also compatible with the latest Wacom Feel driver, which in addition to allowing you to create and map a radial menu to your pen also allows you to configure the pen cap button. The roomy 15.6 inch display can feel a little slippery with the hard nib, but that can be easily rectified with a screen protector if you choose. Everything else about the drawing experience is excellent, as we've come to expect from Wacom Active ES tablets. Like its nearest price and size competitor, the Lenovo Thinkpad Yoga 14, the 7568 can be heavy to hold in tablet mode for very long. You'll want to either rest it in your lap as you draw or place it flat on your desk. The Dell Inspiron 15 resting on the Artisul Tablet Stand 051. Not a perfect fit, but surprisingly stable. Although the laptop is too thick to sit in it perfectly, I tested the Artisul Tablet Stand 051 to get a better drawing angle and it can hold the Dell stably (see above). Another option for all convertibles is to wedge a wrist rest between the display and base to create a more comfortable drawing angle. Having used the Inspiron for a couple of weeks now, I can recommend it without reservation to anyone in the market for a convertible laptop who doesn't need the extra oomph of a discrete GPU. It's a shame that users have to encounter the initial wifi issue during setup, but once that hurdle is overcome, the Inspiron is another in the growing list of great, affordable options for Windows creatives.